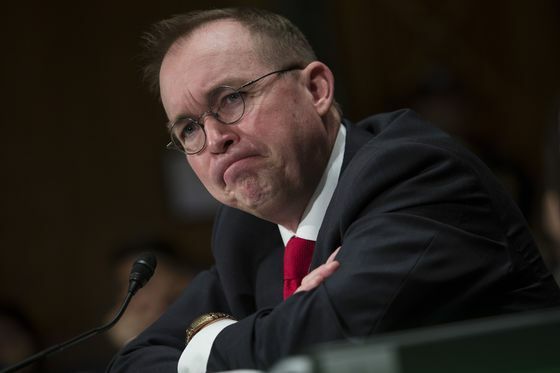 (Bloomberg) -- Acting White House Chief of Staff Mick Mulvaney vowed that members of Congress will never see Donald Trump’s tax returns, as Democrats and the president’s allies spar over whether lawmakers have the right to request them. Democratic Representative Dan Kildee, a member of the House Ways and Means Committee that is seeking six years of Trump’s personal and business tax returns, said the president can’t decide for Congress whether it exercises its legal authority to get the documents -- not with the intention to make them public, but to inform policy decisions by the panel’s chairman and provide proper oversight. “We are looking very carefully right now as to whether or not the IRS is properly auditing and enforcing tax law on the president of the United States, and we’re considering legislative changes toward that end,’’ Kildee of Michigan said on ABC’s “This Week’’ on Sunday. But Mulvaney said a “political hit job’’ isn’t a legitimate reason for Congress to request a president’s tax returns. He called it “a political stunt’’ by Democrats. Ways and Means Chairman Richard Neal of Massachusetts sent a letter April 3 to Internal Revenue Service Commissioner Charles Rettig demanding the returns, citing in part Congress’s oversight responsibility to review the president’s business activities before and during his first term. Trump has told reporters he would refuse the request, and Washington lawyer William Consovoy, representing Trump, recommended in a letter Friday to the Treasury Department and the IRS that they not respond until the Justice Department can issue a formal opinion about whether House Democrats’ request is legal. Trump could request the tax returns of House Speaker Nancy Pelosi and other Democrats but hasn’t done that, Jay Sekulow, a member of Trump’s legal team, said on ABC. “The president isn’t ordering anything,” Sekulow said. As a presidential candidate, Trump broke with years of precedent by not releasing his tax returns. At the time he said he was under audit and would consider releasing once the audits were complete, although no law prevents the release of returns that are under audit.